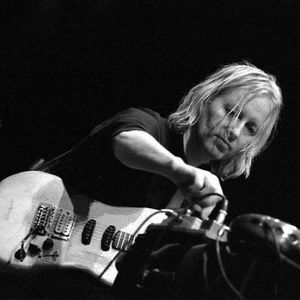 Eivind Aarset is a Norwegian guitarist whose style is often associated with that of nu jazz as his performing, improvising and albums feature a strong 21st century electronic influence. He is considered to be one of the unique re-interpretations of what the role and sound of the electric guitarist can be. Like many guitarists of his generation Eivind Aarset (born 1961 in Dr?bak, Norway) was first influenced by rock players, Jimi Hendrix above all. Like many guitarists of his generation Eivind Aarset (born 1961 in Dr?bak, Norway) was first influenced by rock players, Jimi Hendrix above all. By the mid-1970s electric jazz caught his attention, especially Miles Davis's ?Agharta? album with the fiercely-distorted lead guitar of Pete Cosey raging around Miles electric trumpet. Aarset was also listening to ECM's early albums, especially those of Terje Rypdal and Jan Garbarek. After a period on the road as a heavy rock guitarist, Aarset worked prolifically as a session player, appearing on more than 150 albums in this capacity for both Norwegian and international productions. It was on the session circuit that he first encountered Bugge Wesseltoft and Nils Petter Molv?r. In 1997, Molv?r and Aarset joined Marilyn Mazur's band, and recorded ?Small Labyrinths? for ECM. The bigger news that year, however, was the release of ?Khmer?, Molv?r's genre-changing album, which featured plenty of Eivind's exploratory guitar, now weaving its way between free-running samples, programmed beats and turntable scratching. Inside the Molv?r band, Aarset had plenty of freedom to develop his textural guitar playing, further showcased on his own discs on Wesseltoft's Jazzland label including ? ?lectronique Noir?, ?Connected?, ?Sonic Codex? and ?Live Extracts?. Eivind Aarset can also be heard on ?Mercurial Balm? the new album by Food, the improvising project of drummer Thomas Str?nen and saxophonist Iain Ballamy, released in November in Europe and early 2013 in the US. He has worked with artists such as Ray Charles, Dee Dee Bridgewater, Ute Lemper, Ketil Bj&oslash;rnstad, Mike Mainieri, Arild Andersen, Abraham Laboriel, Dhafer Youssef and Django Bates yet is most known for his work with trumpeter Nils Petter Molvaer.